The Armenian National Committee of America–Western Region announced Wednesday that it successfully defeated House Concurrent Resolution 37, which attempted to praise Azerbaijan’s interfaith tolerance and positive multiculturalism. 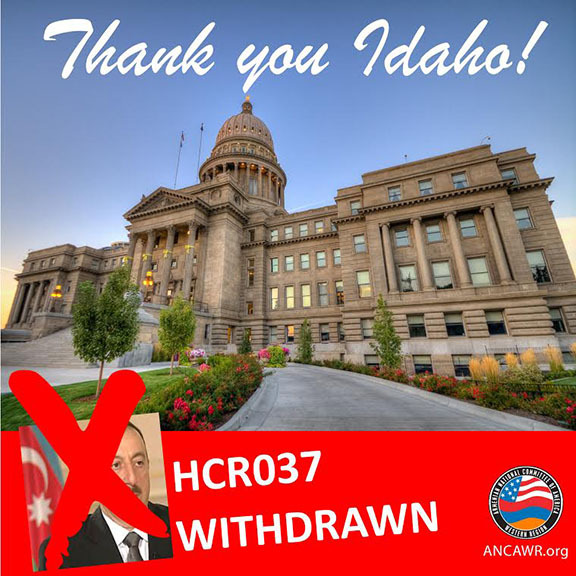 The ANCA-WR led an advocacy initiative and mobilized Idaho’s local Armenian American community to defeat the measure in less than 48 hours. “The quick defeat of Idaho’s resolution in praise of Azerbaijan is a testament to the strength of American democracy and yet another example that our well-organized grassroots efforts will have a stronger resounding effect than that of a foreign paid lobby ,” said Elen Asatryan, Executive Director of the ANCA-WR. “We are proud that the State of Idaho has joined the states of Hawaii, Colorado, California and others to reject the dictatorial regime of Azerbaijan, which is known for its oppression of citizens, press and its persecution of Christian communities. HCR 37, sponsored by Representative Thomas Dayley, was introduced by the Idaho House State Affairs Committee on Feb. 11, 2016. Once alerted to the resolution, ANCA-WR immediately alerted the local Armenian American community, submitted testimony to all House members in opposition to the resolution and called upon all members to encourage the withdrawal of this resolution. Earlier Wednesday, the Idaho House State Affairs Committee confirmed that the controversial measure had effectively been withdrawn killed.